Dell announced two new series of printers at Dell World 2015 to target the needs of SMBs and enterprises. The H-Series multifunction printers are designed for SMBs with cloud access, while the S-Series smart printers are tailored to the security needs of larger organizations. The new printers share similar device IDs, with an open output tray that make them feel more modern and less boxy. Dell's vision for these printers is to enable sharing, whether that's access to documents in the cloud for small and medium businesses or printing workgroup jobs in enterprises that demand added security. All the multifunction printers introduced come with scanning, faxing and duplexing support. The H-Series SMB models also come with Wi-Fi support. There are three models in the H-Series: H625cdw ($399, £258, AU$553), H825cdw ($529, £343, AU$733) and H815dw ($379, £245, AU$525). Like the S-Series, these printers share a similar design ID. With the exception of the monochrome H815dw, the other printers are color laser printers, with print speeds up to 30 pages per minute on the H825cdw. The highlight of the H-Series is simplicity. "The H-Series printers are ideal for IT environments with minimal or no IT support, such as SMBs, remote work spaces, executive offices and micro-businesses," Dell said in a statement. Setup is easy, and all models feature easy Wi-Fi network setup. Users can connect to cloud storage services like SharePoint, Dropbox, Google Drive or Box to access stored documents for printing, a Dell demo representative told techradar pro at Dell World 2015. Additionally, you can also scan documents to these services as well through the Dell Document Hub on the printer. On mobile devices, Dell also offers Document Hub as a free download on Windows, Android and iOS platforms. This allows for wireless printer without a laptop. NFC printing is also supported. Lacking the Document Hub capabilities of the H-Series, the enterprise-class S-Series is focused on security. The family includes the color laser S2825cdn ($479, £310, AU$664) and monochrome laser S2815dn ($359, £232, AU$497). 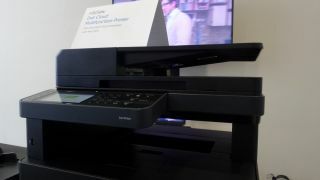 These printers are identical to the S2824cdn and H815dn, respectively, but the S-Series lack the Document Hub, cloud connectivity and wireless connectivity of the SMB models. Instead, S-Series printers are focused on security. "The new S-Series printers address the security needs of larger organizations by offering a Secure Print feature and also guarding against unauthorized access with secure walk-up user authentication and Lightweight Directory Access Protocol (LDAP) with Kerberos authentication," Dell said in a statement. sers can also use an access card for secure printing or enter a PIN number on the large 4.3-inch touchscreen, said Ron Schoaf, Senior Product Manager at Dell Printers. "These new devices are so much more than printers; they're workflow and collaboration enablers that mean huge efficiencies for today's ever-connected mobile workforce," said Dell. These printers are energy efficient and the new low melt toner technology takes up less space inside the printer, so the devices occupy less footprint in an office, Mr. Schoaf said.